Many areas in The Bahamas make tricky work of anchoring, especially where reversing currents can break out an anchor and set you adrift. 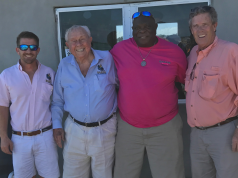 The Bimini Channel, Normans Cay Cut in the Exumas and the North Current Cut near Eleuthera are three notorious places that wreak havoc with anchored boats as the tides turn. 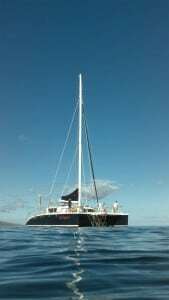 If you want to sleep well at night, review your technique, your choice of anchorages and your ground tackle before your next anchoring adventure. A popular two-anchor technique that works well in reversing currents is the appropriately named Bahamian moor. Two bow anchors are set 180 degrees apart with the bow of the boat as the midpoint. Drop the first anchor up-current, motor back and set it, letting out double the rode you’ll need for a 7:1 ratio of rode to depth. Drop the second anchor down current, then fall back to the midway position and snug up both lines. Take care not to wrap the line in the props when backing down on the second anchor. If nearby boats lie to one anchor, your swinging radius will be different from theirs so give them plenty of room. A Bahamian moor works best when a consistent wind blows across the current and keeps the bow steady in one direction. Without a breeze, the boat may spin as the current reverses, twisting the lines. 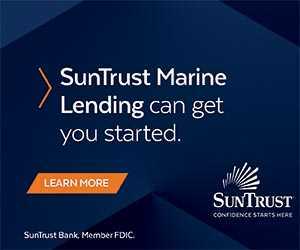 You can minimize this in two ways: First, if possible, cleat one anchor line at the bow on one side and the other a few feet back on the other side. The boat will not be able to spin in place with both lines taut. Second, use a swivel with three lengths of chain. The swivel has two eyes or shackles on one side to connect to the chain leading down to the two anchors, and one shackle on the other end connects to a third length of chain that reaches up to the vessel. Regardless of the boat’s dance at the surface, the swivel does all the twisting. Keep in mind, however, that this method takes advanced preparation, extra equipment and more time to set and retrieve the anchors. 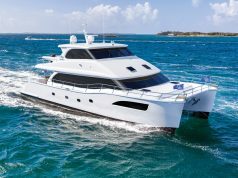 Most Bahamas anchoring is done in less than 15 feet of water, so 100-120 feet of chain or line should be sufficient. A bow lookout can guide the driver to a nice patch of sand on an otherwise grassy bottom and watch for the telltale cloud as the anchor makes contact. When setting the anchor, take care not to pull it out of the sand and into the grass. Hitting a small target with an anchor hanging off a moving vessel requires practice. Don’t be shy about repeating the process until you’re successful—it’ll be worth it. On a coral pan, there is nothing for an anchor to dig into and it will generally just slide on its side without hooking up. This is a dangerous situation and you’ll recognize a dragging anchor by the chain skipping or jerking in the bow roller. Always try to snorkel on your anchor to check its position and its environment. An anchor painted white is easier to spot underwater and is an easy DIY project. Of course, the last tip—which arguably should be the first—is don’t anchor in sketchy places like cuts where water gets squeezed and currents speed up. If a mellower anchorage is one bay over from where you’d like to snorkel, use the dinghy to commute, but stay overnight around the corner. Types of anchor are a hotly debated subject. I find at a bar, the opinions grow louder and convictions stronger with each cocktail. The truth is that the best anchor is the one that fits the circumstances: type of holding ground, current, and tides, and the type and size of boat. In a perfect world, we’d have one of every sort just to be safe. Not having that kind of space or budget, I carry three: a Manson Supreme, an original Bruce, and a Fortress. The first two are on the bow and the last one is used as a stern anchor because it’s aluminum, so it’s light and easy to manage by hand from the stern or dinghy. My Manson (similar to a Rocna) has dragged only once and that was in the grass, the nemesis of all anchors. I’ve found the advantage of a claw like the Bruce or Lewmar, is that it tends to reset quickly and typically on its own if it breaks out. 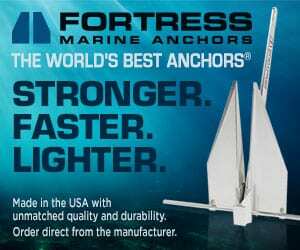 Fortress and Danforth anchors with opening flukes are excellent in mud and sand and stow easily off the bow roller on smaller vessels. I’ve also had good luck with a Delta and a Spade. I believe in all chain rode, at least for the primary anchor. The chain won’t chafe through on rock or coral, creates a nice catenary and adds a bit of heft to an undersized anchor. The secondary anchor should have chain equal to at least one length of the boat and another 100-150 feet of nylon rode. My stern Fortress has 50 feet of chain and 265 feet of flat polyester webbing on a Quickline that stows nicely. A working windlass is key to any successful anchoring routine. For a Bahamian moor, a windlass should have a chain gypsy on one side and a line winch on the other. If you haven’t serviced your windlass in a while or even used it for that matter, remember that it’s cheap insurance so it should be in working order. Take off the cover, check the pawls, lubricate necessary points, and lay eyes on the wire connections to ensure they’re solid. 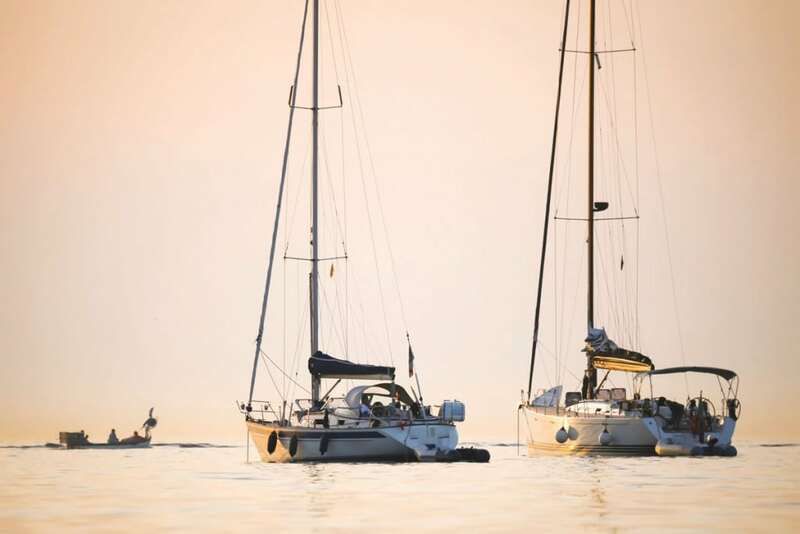 Finally, be sure to check the weather before choosing an anchorage, and set an anchor alarm on your GPS. Then, I promise, you’ll sleep like a baby.